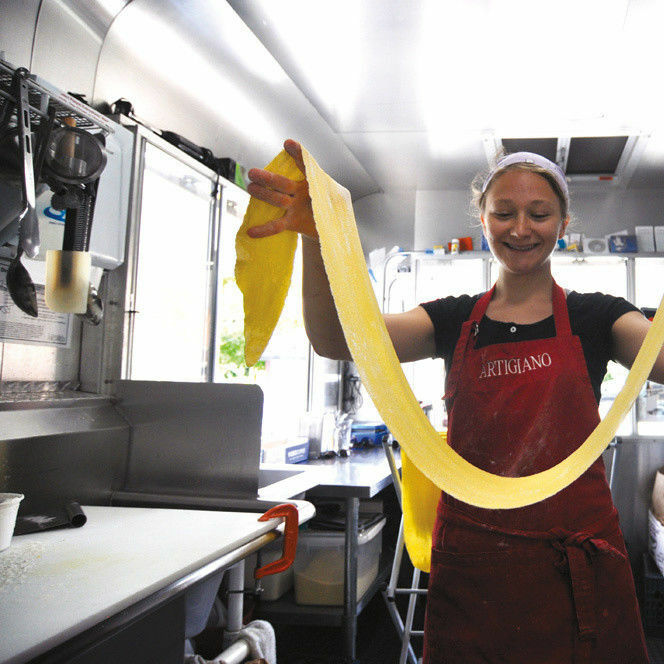 Artigiano is a bright red, truck-size pasta machine, cranking out pounds of the stuff for Division’s blossoming “Eat Street.” Owner Rachael Grossman flattens sheets of fettuccine, crimps delicate ravioli, and carefully marks tender gnocchi with the telltale tines of a fork, all while delivering serious flavors in sync with the seasons. Chilly months brought out pastas with crispy pork and hearty ragùs. In warmer months, fresh chard, kale, and Meyer lemon tumbled in a bed of fettuccine. The gnocchi, with creamy thumbprints of mashed Yukon gold potato draped in a velvety truffle and crimini mushroom sauce, is a reliable knockout, reaching far beyond food cart expectations.